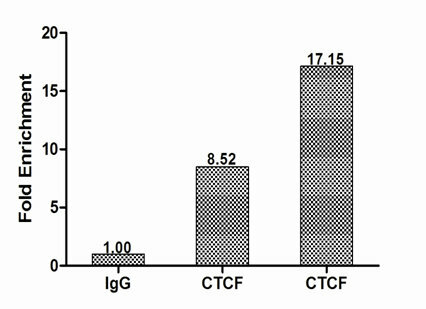 Chromatin Immunoprecipitation Hela(1.2*106) were cross-linked with formaldehyde, sonicated, and immunoprecipitated with 4ug anti-CTCF or a control normal rabbit IgG . 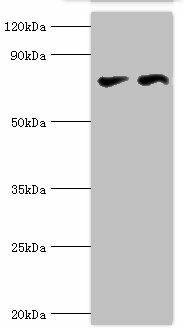 The resulting ChIP DNA was quantified using real-time PCR with primers against the H19ICR promoter. 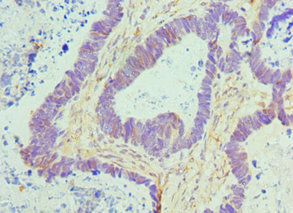 CTCF Polyclonal Antibody. Unconjugated. Raised in: Rabbit.